Chronicles from Iran » English » Economy » Rial vs USD: Hang Them All! Rial vs USD: Hang Them All! Rial vs USD: Rial is worthless and USD exchange has gone underground. Now what? Find a few Mofsed-e-felarz to execut for the love of the Leader? The day after the New Year’s holidays, the Iranian rial fell against major currencies, specifically against the USD, the reference money for trade, even in local markets. The Iranian exchange market closed on 19th of March with a USD worth 47,700 rials. Two weeks later, Iranians returned from holiday to work. The exchange bureaux price for a USD was 51,200 rials. By the end of the week, the USD had reached 61,000 rials. The rial was 30% weaker than many currencies. The government panicked and did what has become a Rouhani-only method of dealing with such issues since his first mandate as president in 2013: by threatening the closure of activities, forcing the traders in currencies to buy and sell the USD at a lower rate. Imagine for a second Ms Angela Merkel sending the Bundeswehr to the ECB to dictate her wishes to the bankers. Ridiculous imagery? Read some more. As the USD reached 61,000 rials, Rouhani’s vice minister, Eshaq Jahangiri, declared that the USD must be exchanged for 42,000 rials, starting on the 10th of April. For Jahangiri, a sycophant revolutionary, the fall of the rial cannot be explained and is unnatural. The exchange rate above 42,000 will be considered as contraband, similar to smuggling illicit drugs. Since the 10th of April, except undercover, no one has been buying or selling the USD. The exchange bureaux are closed and the USD has vanished from the open market and gone underground. As any Iranian can testify, nothing in Iran escapes the vigilant eyes of the ayatollahs. All the sciences come to them so naturally that every ayatollah exudes an innate, unquestioned belief in his own talent and knowledge. The rest of the world must follow. This is what Grand Ayatollah Nasser Makarem Shirazi declared, referring to those who would pay more than the official rate for the USD. Contrary to Jahangiri, who could not find a natural reason to the fall of the rial, for the Grand Ayatollah the catastrophic economic situation and the dramatic fall of the rial can only be attributed to the home-grown hypocrites and their foreign masters aiming to fuel riots in Iran. 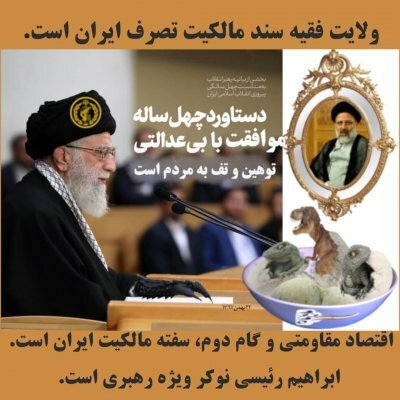 Therefore, they should be condemned as Mofsed-e-felarz – most corrupt [persons] on Earth – and be hanged according to the Islamic criteria, if they dare sell the USD for more than 42,000 rials. Take any subject, oversimplify it, add a dash of Islamic criteria, shake well and you have an explanation for anything from the brain-dead morons who make the headlines. When the rial has less value than the paper used to print it on, fix the exchange rate. When the abstruse Iranian banking system fails, hang a few foreign spies and agents. When hard currencies are short in the country, use one or two imprisoned dual-nationals as bargaining chips with the Western country concerned. The London School of Economics (LSE) should have a couple of Grand Ayatollahs as visiting professors on finance and economy. Ridiculous imagery? Think again. As USD trade goes underground in Iran, grumpy people who need the US currency to travel or send for the upkeep of their children studying abroad are adjusting, but will certainly not make a more significant move. Sooner rather than later, the real exchange rate will be spread over the goods and services – the strain of the international sanctions and various embargoes is already telling. Then, the inflation will empty the little left in the pockets; bread will cost the earth. Then what? Find a few Mofsed-e-felarz to hang? Or stage street shows for the benefit of the Leader? If the IRGC has some make-believe power to show off in the Middle-East and Syria, sheltered by the Russian army, the Iranian economy is eggshell thin that one expect it to shatter into pieces any time now. The total collapse of the Iranian economy, – unproductive, consumer and living on importation -, will not dent the global economy. Only the Iranians will pay the price of decades of an abscond economic and financial mismanaged by the dogmatism of the doctors in Koranic verses. The former would have only themselves to blame for as they have accepted to dance to the tunes the theocracy has played. 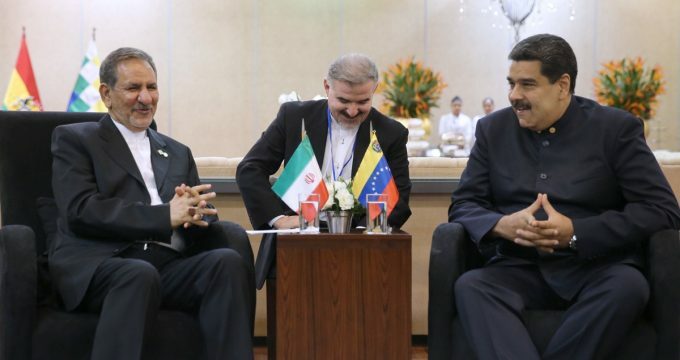 The economic and finance dabblers: E. Jahangiri (Iran) and Nicolás Maduro (Venezuela). Maduro replaced H. Rouhani as the president of the Non-Aligned Movement (NAM). 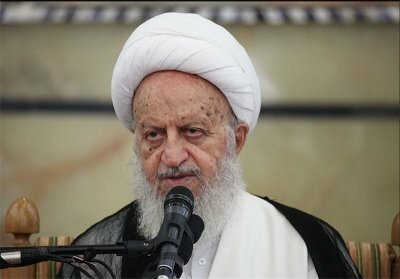 Naser Makarem Shirazi would kill anyone to keep people chained in the cave of obscurantism.